For our fourth game, we decided that the topic would be on identifying numerical place values. At first we thought of the don’t-let-the-mosquito-get-to-the-kid kind of game, where in the player must answer the question by splatting the mosquito with the correct answer before it bites the child. But we wanted the game to be more child friendly so we changed the mosquitoes to ants, and the child to cake. The process is still the same, the ant with the correct answer will be splatted. The interaction that we plan to use here are using the directional buttons of the wiimote to choose the right ant and then swinging down to splat the ant. Still, this is subject to change. 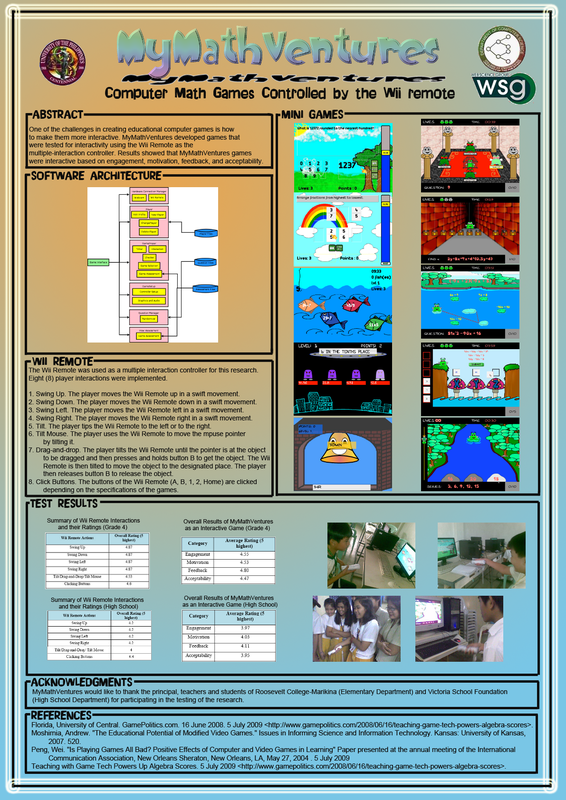 We forgot to blog our second game results, so here it is (though we’ve already shown this during the final presentation last sem). We are almost done with our first game, and we also started packaging the classes that we are using including those that we are going to test for “reusability”. We just had a problem when running the program on VMware, but it does run properly on other machines. We still can’t figure out what’s wrong. It does not return errors, so we’re really clueless about it not running on VMware. Game-based learning or GBL refers to the different kinds of software applications that use games for learning and educational purposes. If used effectively and in a coherent and relevant way, can support both the option of more choice for how the learner can learn as well as offering the potential for personalizing the learning experience. Moreover, it also offers a way of integrating a range of different learning tools into a more coherent view of learning from the learner’s perspective. However, it relies upon two factors: readiness of the learner to adapt to a new learning tool and the correct level of institutional support.